Employers can no-longer overlook the impact that nurturing workforce wellbeing can have on productivity, talent development and retention. 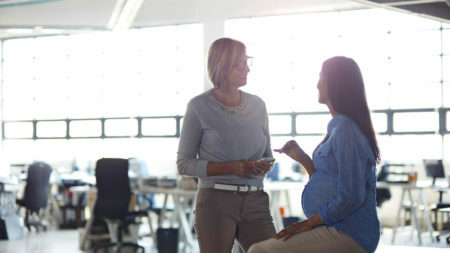 The wellbeing of a workforce goes far beyond what an employee is paid every month – these programmes help employees feel financially healthy and valued by their employer. Providing benefits is challenging and expensive – quite often benefits that seem attractive and would cost a small fortune if secured by the individual on the high street simply don’t get taken up. The answer until now has been to engage with employees to make them aware of what’s on offer, make them more comfortable about taking them up and to understand the value of those benefits. But employee engagement, while well intentioned, doesn’t go far enough in meeting the ultimate aim of making people feel financially secure. It rarely deals with a single individual as these approaches tend to be one-size-fits-all campaigns designed to capture as many hearts and minds with the minimum of fuss and complexity. Focusing only on the benefits rather than the individual’s needs means there is no overall context for the employee to understand how the benefits fit into their own financial circumstances. Traditional engagement is definitely part of the journey, but we can’t stop there. We need to focus on improving people’s financial health and help them to feel positive about their future. We know that people worry about money – having enough, getting more, how long it will last. Money worries are usually the greatest source of friction in relationships and if people aren’t happy at home, they won’t be happy at work. Stress is one of the biggest causes of workplace absence – it makes people sick. Anxiety about finances can be equally crippling, even for those who make it in to work every day. A workforce that is saving positively and planning their finances will be less stressed. 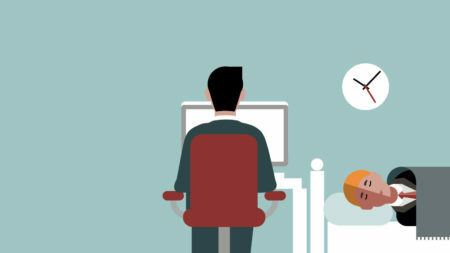 Less stress means less workplace illness and days off, which have their own cost-benefits. 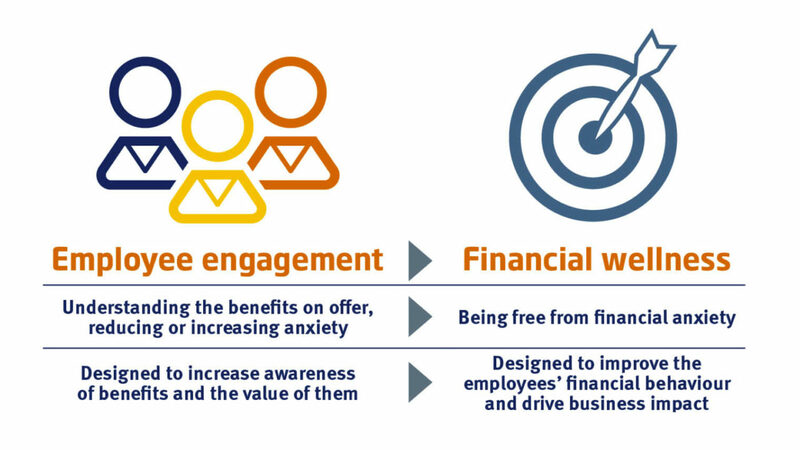 Giving employees an insight into their own financial world and helping them to understand they can take control of their financial behaviour not only helps reduce their money worries, but it can deliver a more engaged and productive workforce. Financial wellness moves beyond just engaging with employees. 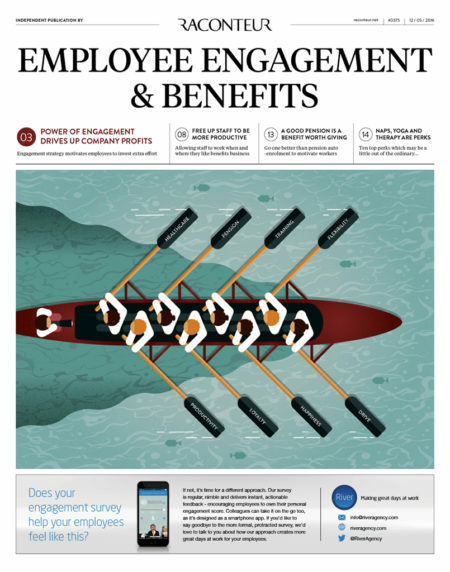 Engagement is focused on making people understand their workplace benefits and how valuable they are. But financial wellness is targetted on helping employees understand how to make positive decisions to contribute to their own concept of wellness. In other words, the employee’s aspirations replace the benefits as the goal of the engagement. The starting point is for the employer to understand what is important to their employee as an individual. A far more positive corporate culture emerges where financial wellness is pursued. Understanding employee goals allows employers to build benefits structures that really do benefit their workforce. This drives up goodwill towards the employer because the employee understands not only why the employer offers the benefits, but how they can be used to further their aspirations, whether a deposit for a house, putting kids through education or planning for retirement. It is a win-win for both employer and employee, and an objective worth aiming for. 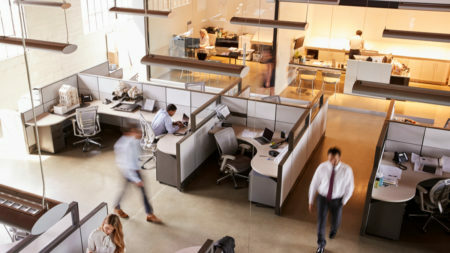 These benefits structures are more efficient because they are what employees really want, reducing waste on unused offerings and may even save money in the long run. 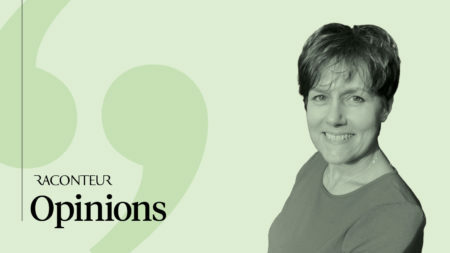 Recent changes to pension freedoms provide greater responsibilities for employers in terms of administration and communication, but also offer a great opportunity to reconsider how they help employees understand their benefits. There remains a degree of suspicion around pensions and people never like putting money away for a time they consider too late to enjoy it. The ISA brand is trusted and should help generate a more positive attitude towards saving, particularly among younger workers. The lifetime ISA is potentially a great addition to the benefits mix, but doesn’t replace the need for occupational pensions. There are, of course, minimum standards under auto-enrolment, but the lifetime ISA adds another dimension to long-term saving. This new vehicle offers savings continuity between leaving school and the point of having settled down when most people, often too late, start to think about their future and, ultimately, retirement. In doing so it can promote a positive savings habit in younger people that will contribute to financial wellness in the longer term. Combining these and potentially other savings products within a financial wellness programme, provides an employer with a platform that will help to deliver a more progressive benefit structure which focuses on the needs of their workforce, and in turn meets the needs of the business. This can result in a financially well workforce, which is productive and positive in their relationship with their employer. You don’t have to be a paternalistic employer to understand that financial wellness doesn’t only work your employee benefits structure harder, but smarter too. We believe having high-quality savings options available in the workplace will ultimately create good outcomes for individuals at retirement, and can only impact positively on the financial health of employees and, in turn, the business. It will become increasingly common for an ageing population to realise they cannot afford to retire when they thought they would. Having employees who have planned their future provides an employer with a greater control over succession planning. And employees who feel more connected to their employer, because they value the contribution their benefits make to their financial wellbeing, produces a very positive dynamic. Aside from making a more productive corporate entity, this feeds into the fabric of the culture, into the employer’s overall status, and why benefits were introduced in the first place – to attract and retain the best employees available. Now that the annual and lifetime allowances for pension savings have been reduced, more people will have to take care to ensure they don’t pay more tax than necessary. But many may not even be aware of it. Standard Life worked with one of its clients to deliver a tailored financial education campaign designed to tackle this problem. Getting people to engage with these sorts of messages is often difficult, so the campaign was carefully designed to target the right people and then give them useful information in the way they wanted. We looked at salary, pension contributions and projected pension value – just over 230 people were chosen. They were then sent a series of e-mails, which invited them to book a place at a seminar and/or a one-to-one session, and to find out more by going to a microsite. The e-mail campaign was extremely effective, outperforming industry benchmarks by a huge margin. Everyone who opened an e-mail clicked on at least one of the calls to action. Within two days of the first e-mail being sent, 164 people had made a booking, with 51 more doing so over the life of the campaign. Traffic to the microsite shot up by more than 300 per cent on the previous month. The events themselves were equally effective. In all, 134 individuals attended an event. There was the opportunity set aside for one-to-one appointments with our in-house advisers. By attending these appointments people were able to really understand what option would be best for them and make better decisions about their pension savings. 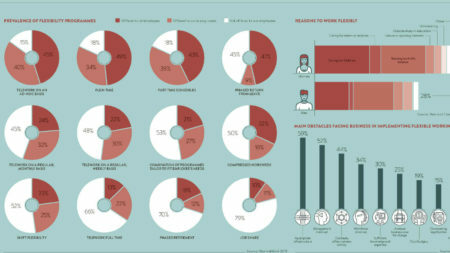 The results of the feedback survey paint a clear picture – 65 per cent of respondents rated the event very valuable, with the other 35 per cent rating it quite valuable. Everyone said they would definitely or maybe take action following the event – again about two thirds and one third respectively. And every attendee also said they were either extremely likely or very likely to attend a similar event in future and recommend it to a friend. The campaign moved fast, with just 15 working days between the decision to run it and the first event. Even under that sort of time pressure, Standard Life demonstrated that if employers work closely with their pension providers to create a thoughtfully designed and carefully targeted campaign, they can achieve surprising results. 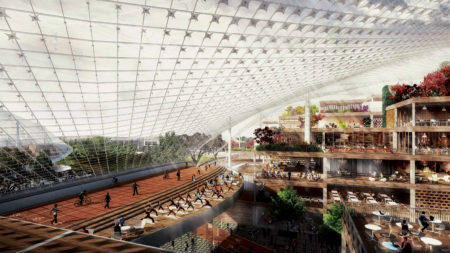 Office design: what does the future workplace look like?